Material and Machining Technics: Made of high strength aluminum alloy. Adopt advanced CNC manufacturing process and surface anodizing treatment, which make it exquisite in appearance and smooth in operation. Low Center of Gravity Design: Its locking structure has been moved to the side of the ball head, making its center of gravity lower 15% above than traditional ball heads, having better stability. Double Notch Design: Adopt the double U-shaped notch design. Can quickly switch between vertical shooting and horizontal shooting. The large locking knob of D-30 ball head adopts wide handle design, locking powerfully and operating comfortably. If the locking knob hinders the utility, you can put it out to adjust its angle. It can control the tilting angle of shooting. 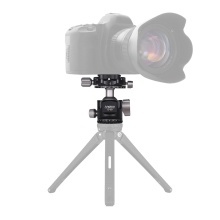 Double Panoramic Structure: The disc-shaped base and the disc-shaped quick release clamp can achieve 360° panning movement with calibrated precision for double panoramic shooting. Safe and Anti-skid System: Its quick release plate comes with 2pcs anti-skid nails and 1pc anti-skid rubber pad to prevent your camera from accidentally dropping. Wide Compatibility: Max. load capacity is up to 18kg. With 1/4 inch screw on top, suitable for most DSLR, ILDC cameras. With 3/8 inch screw hole and 1/4 inch to 3/8 inch adapter screw, the ball head can be mounted on almost any tripod, monopod. 1 built-in spirit level in its quick release clamp plays an important role in balancing your camera and locating view finding. Comes with a nylon carrying bag, can convenient to put the ball head in it and hang it on your girdle. Very portable.